Home - Archive by category "Decks"
Welcome to Yeah We Do That’s tip of the week. This week I would like to talk to you about simple deck maintenance, more specifically how to clean and seal your deck. 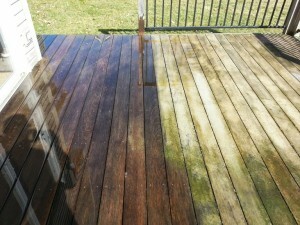 This is a project you can do yourself over a weekend and will help beautify and preserve your deck. This should be done every few years to get the optimal life out of your deck. Cleaning and sealing your deck is a relatively inexpensive project and with a little bit of preparation along with your time and labor in about a weekend you can have a new looking deck. If you would like to do this as a weekend project you would start on Friday by removing any furniture or items from the deck then thoroughly sweeping the entire deck area followed by washing as much dirt off as you can using a garden hose and a jet nozzle. Allow the deck to dry overnight then on Saturday you would apply a deck cleaner which may be purchased at any big box or local hardware store. You want to make sure you buy the appropriate cleaner for the type of deck that you have as there are separate cleaners for wood decks and the newer synthetic decks. The easiest way to apply the cleaner is through a pump sprayer but you want to get one specifically designed for use with bleach products as the deck cleaner can be corrosive to the metal tip spray wand as well as any internal metal parts. Prior to application you want to make sure to thoroughly wet all of the grass, shrubs and plants around the deck that any overspray may get on. You may also want to do this on a day when it is not very windy as the fineness from the sprayer can blow quite a ways landing on trees and ornamental shrubs and may burn leaves that are not wetted. Follow the manufacturer’s directions as far as application but most products are applied directly to a dry clean deck and require no scrubbing (in most cases) and will usually work in one application removing embedded dirt, algae and some mold stains. Make sure to also spray your handrails balusters as long as they are made from the same material as your deck, again do not apply this if your handrails and or balusters are made from metal as this may rust any metal it comes in contact with. After application allow product to sit for the recommended amount of time which is usually 10 to 15 min. and then hose off and allow to dry overnight. Now comes the part where you will seal your deck. Again, he will have several options and choices of sealers. You can get a plain clear sealer, transparent stain/sealer or a solid stain/sealer. I will explain the difference below. Clear Sealers – provide water and UV protection for your deck while adding no color whatsoever to the wood. Transparent Stains -Add color to your deck but allow the wood grain to show through. This is my personal favorite as I enjoy seeing the wood grain on my deck. Solid Stains – Add color to your deck but are more like painting and staining as you will see no wood grain through the stain. Application – there are several methods you can use to apply your sealer/stain to your deck. Sprayer – you can apply the deck stain with a sprayer however you must be very careful to make sure that the application is uniform or you will have lighter and darker areas if you are using a sealer with a stain. While in my opinion this method is a little more wasteful with the stain it is useful when it comes to getting the color in between the boards as well as stating the balusters and vertical surfaces. You must be careful when doing vertical surfaces to make sure that the overspray will not land on anything you do not want stained. Paint Roller – you can use a paint roller, and I like the 18 inch wide paint roller when I use this method to apply my sealer/stain. Like the sprayer you must be careful to make sure you are applying a uniform coat to the deck. The drawback to the paint roller method is it does not get the stain in between the boards showing the color difference in less you go back with a paintbrush and paint in between the boards. Deck Stain Applicator – this is a very good method to use as the applicator is designed specifically for applying sealer/stain to your deck. Many applicators even have a little indentation that hangs down that you aligned with the crack in the boards that will put the stain in between the boards as well. The only drawback to the applicators I have noticed are they do not hold very much stain and also if the deck is older and weathered the roughness of the wood can snag and tear the applicator. But all in all this is a good choice for the first timer. Like with the other two methods you still have to be careful to make sure you are applying and even coat to make sure you do not and up with light and dark areas after it dries.